Click on the Play Button and 'Chill the Piro' will start after this message... Thanks for waiting! This platform game has a strong retro feeling. Defeat your enemies before time's up! Use the arrow keys to move, press the space bar to attack and Z to throw bombs. New levels available! Choose your favorite ice-cream flavor and try to collect all the fruits in each level while you avoid your enemies creating ice-cube barriers. Both single-player and two-player modes are available. You're a great fireman put the fires in the buildings out as fast as you can. You have to free your friends and defeat your enemies before time's up. Choose your favorite Wise Man and collect all the presents in this fun platform game. The more presents you find, the more items you'll be able to add to your letter to the Three Wise Men. Choose your favorite ice cream flavor and go pick up all the fruits in each level while you avoid your enemies with ice barriers. Both single-player and two-player modes are available. Pilot an aerobatic aircraft and complete every level fly through the hoops and burst balloons before time's up. Complete the missions you're assigned and ruin this town before time's up. Drive a firetruck, load it with water and take it to the fire without losing a drop. Enjoy the new stages! Choose your favorite ice cream flavor and try to collect all the fruits in each stage while dodging your enemies using ice cube barriers. Both single-player and two-player modes are available. 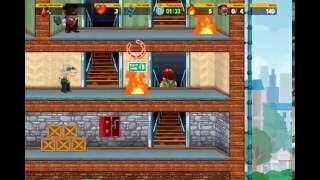 Control a brave firefighter and get ready to put out the fires in each stage. Use water, extinguishers and even your boots if necessary! Put your reflexes and skills to test!